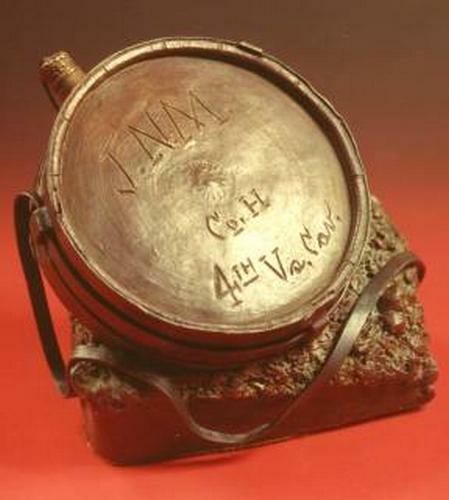 Commonly made of cedar, maple or cherry, the Confederate wooden drum canteen was a necessary expedient in order to conserve limited metal resources. The original in my collection, from which this was sculpted, is inscribed with the name "J.P. Burford" of a Va. Regiment." A fun little piece to do. Somehow, the mold became lost with just under fifty pieces ever cast. If found, they may become available again to finish out the edition. It might be worth noting here the role that canteens keep playing in many of my pieces. Being bearers of life-giving water, they invariably connote the symbolic connection between the life-force of the individual with the universal life Force. "All is one. But One is so many."